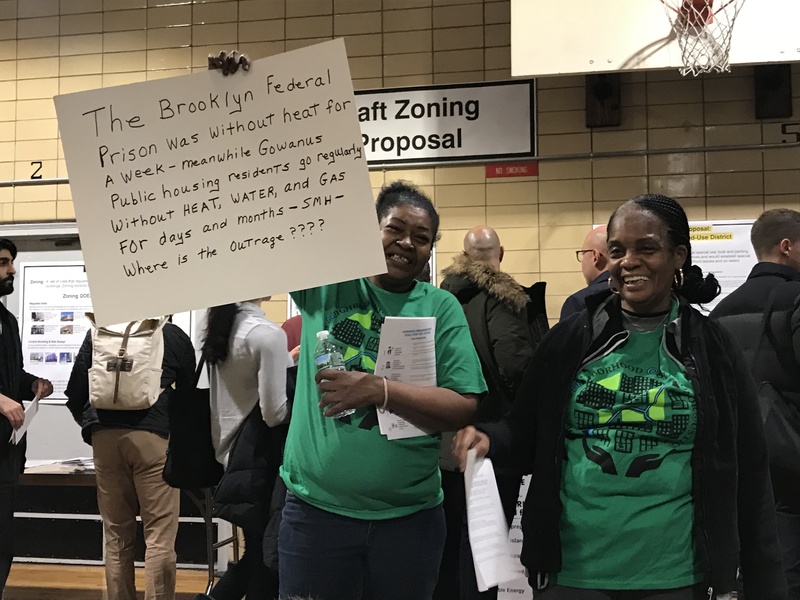 GOWANUS – An activist group hijacked the NYC Department of City Planning‘s (DCP) Gowanus Draft Rezoning Proposal open house Wednesday night, staging their own meeting at the event held inside the packed gymnasium of P.S. 32. 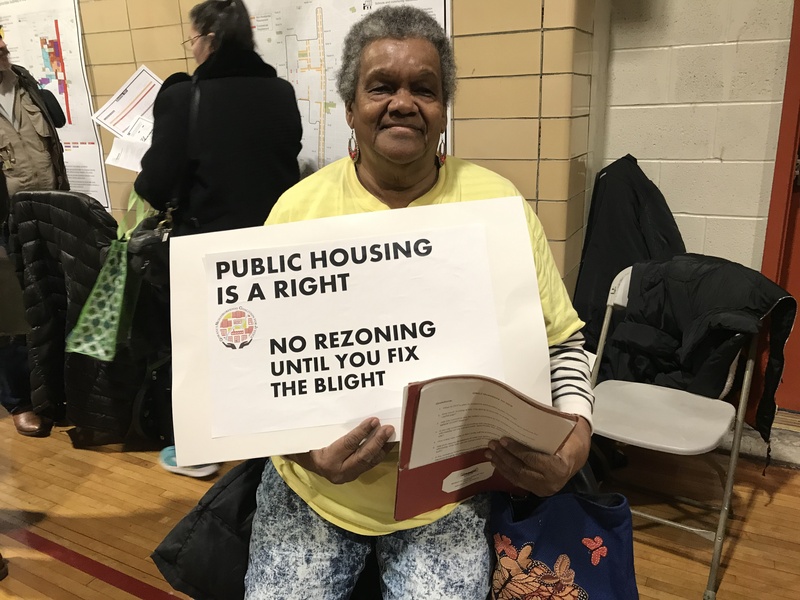 Hundreds showed up last night for DCP’s first community gathering since releasing the Draft Rezoning Proposal last week. 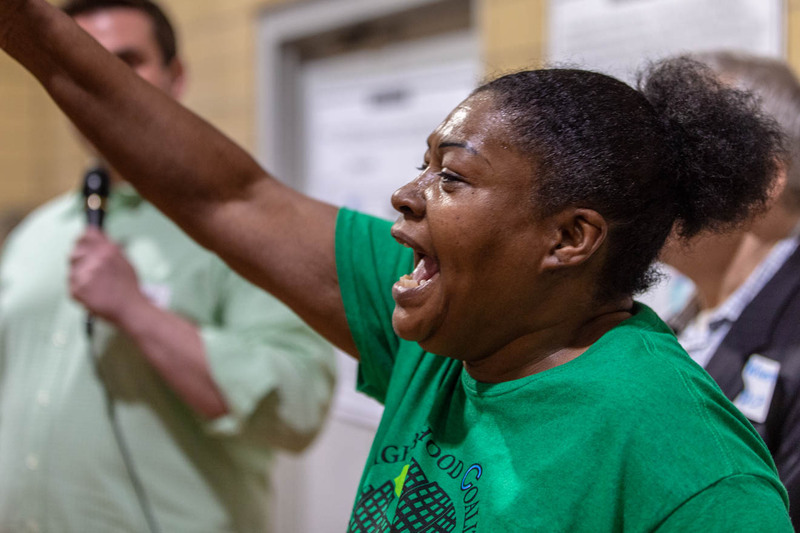 Dressed in the organization’s green and yellow t-shirts, the members of the Gowanus Neighborhood Coalition for Justice (GNCJ) came prepared, armed with signs, dozens of folding chairs, and a sound system, setting up their own counter-event in a corner of the gym. 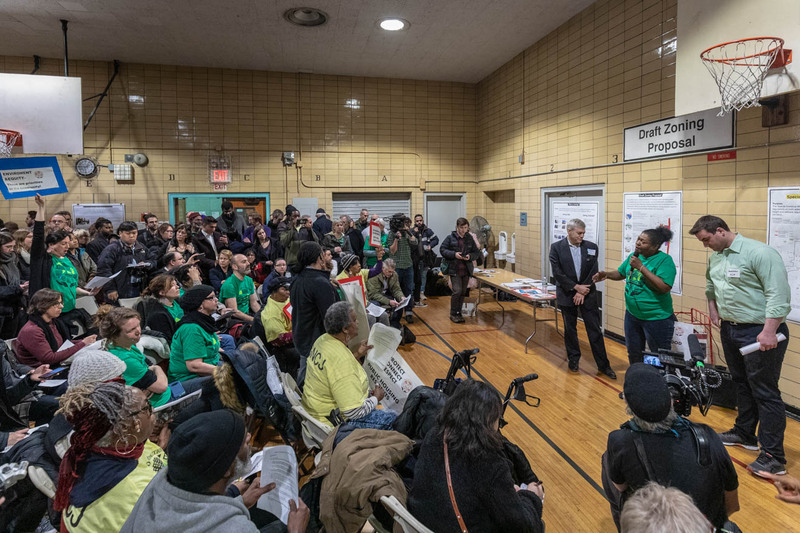 The Coalition hoped to convince officials representing various city agencies at the open house to join them in a question-and-answer session addressing their concerns about the draft proposal—particularly its lack of consideration for the three public housing developments in the area. “Our concerns are about making sure our buildings are fixed—the mold, the lead. 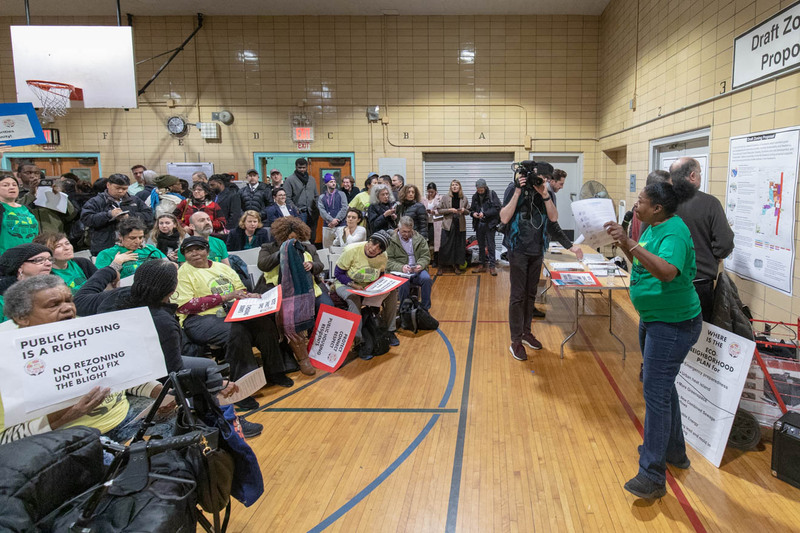 We want to make sure our doors are locked at night and not broken,” Cherry Shivers, a GNCJ member and 53-year resident of Wyckoff Gardens, told Bklyner before the meeting. “We love public housing. We like living in public housing. We are angered to the point where we want things done. We want to get answers,” she added. Using the Gowanus Framework—a document created in 2018 following more than 100 hours of community meetings and workshops—as a “roadmap,” DCP developed the Gowanus Draft Zoning Proposal to “facilitate a vision for Gowanus’ future that is sustainable, resilient and inclusive, with a mix of uses that support new affordable housing and local economic and job growth,” according to a statement by DCP. 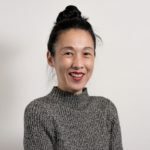 Launched in 2017, GNCJ is a group of Brooklyn residents, community-based organizations, and small businesses that advocates for low- and moderate-income residents, public housing tenants, and industrial and commercial businesses. DCP Project Manager Jonathan Keller and Winston Von Engel, Director of the agency’s Brooklyn Office, came forward and joined Blondell on the makeshift stage. “How does the draft DCP plan preserve and protect public housing?” was Blondel’s first question for the pair. Next, Blondel asked, “Is the city committed to providing the necessary subsidies to provide 100% affordability on city-owned sites, specifically the Gowanus Green and Public Place site?” Keller responded by reminding her of the November workshop which discussed 100% affordability at Public Place as well as commercial, open, and park space.”We’re working with the development team and HPD to make that happen,” he assured her. Among GNCJ’s other demands are “a commitment of 100% affordability on all publicly-owned sites in Gowanus. 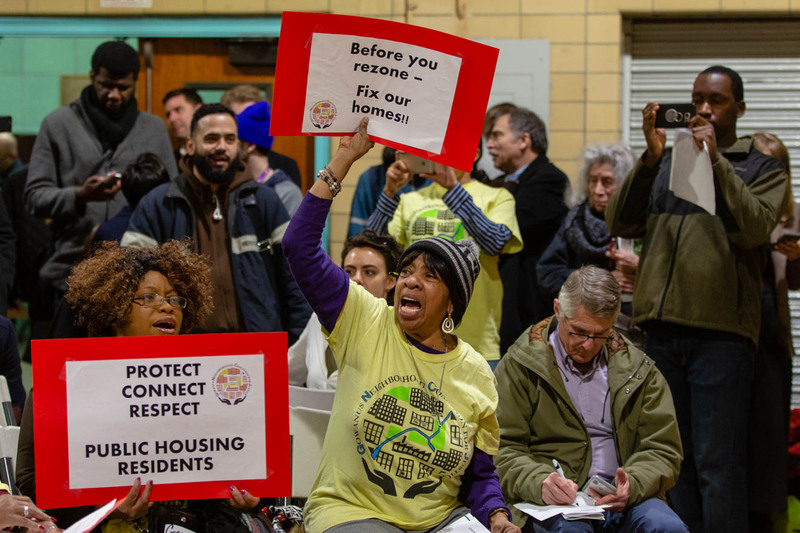 100% affordability for the people who already live here,” said Blondel, as well as “the deepest affordability options for MIH (Mandatory Inclusionary Housing).” The Coalition is also calling for new financial commitments for NYCHA. “We haven’t heard one funding commitment in this rezoning framework. Where’s the money for this community?” she asked. A member of the audience added “none of the stuff that’s in this plan is what people actually wanted. People wanted more schools, NYCHA housing fixed, the sewage problems fixed, better transportation, park land. High-rise luxury housing is not what people were looking for,” he said. “We spent two and a half years discussing, working with the groups, spending a lot of time getting to know everybody in the planning department. I would like to know why this is the format today?” asked another audience member. “It should be a presentation. The least [DCP] could have is a presentation of the draft that we participated in [creating]. I don’t see a lot of the things that we requested in this draft,” she added. “To reiterate what we’re saying, we spent two and a half years going to work groups,” Blondel noted. “The way this format is set up, I don’t actually see anything that we specifically talked about in these plans the way you set [it] up. I’m not saying they’re not there…. We want a PowerPoint presentation where somebody is going slide by slide, showing us block by block…” [cheers of approval drowned out the rest of her statement]. The Proposal covers an area (see map) bounded by Bond Street and 4th Avenue (west to east) and Baltic Street to Huntington, 3rd, 7th and 15th Streets (north to south), the zoning proposal addresses sustainability and resiliency; housing; economic and job development; community and cultural resources; waterfront and open space; and building density. “There still isn’t any real water access. The water access that is labeled and talked about on the posters…really means water views,” Francis added. “They’re talking about elevating the land, so the bulkheads that are already very high above the waterline are going to be even higher and if there are no ladders and no docks or any other means for someone who’s fallen in the water to get out, that’s a problem,” fellow Dredger, Brad Vogel, added. 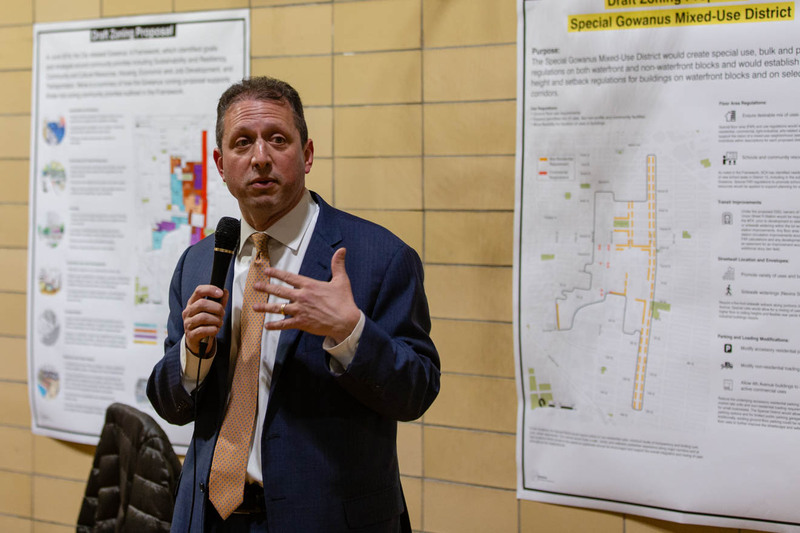 Council Member Brad Lander also came forward and joined GNCJ’s meeting, acknowledging that the draft rezoning proposal does not currently do enough to address the issues of public housing developments in Gowanus. “We aren’t going to have a satisfactory plan until we get to a place where there is more investment in public housing,” he told the crowd. “We also know that some of the neighbors in the industrial business zone have a lot of issues that they need attended to and that we’ve got work to do there,” he added. 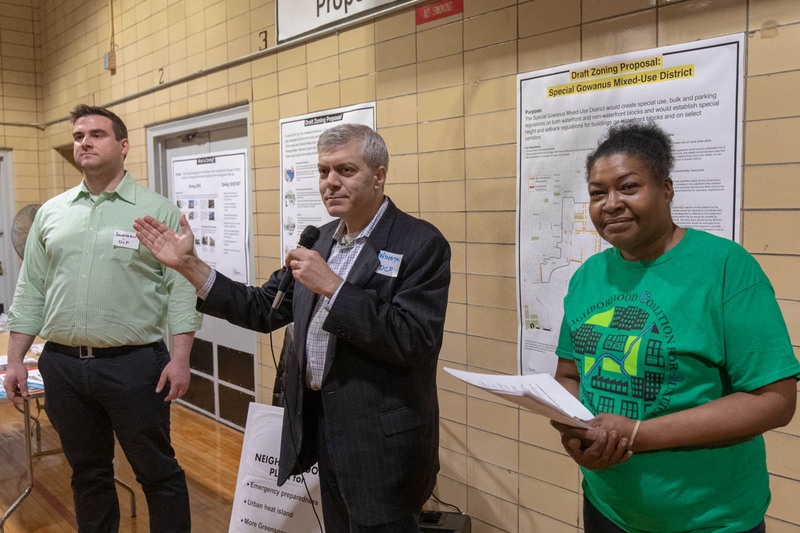 “I encourage you to take a look [at the proposal details] because there actually is some really interesting stuff about schools…” as well as transit, resiliency and sustainability, and open space, the Council Member insisted. 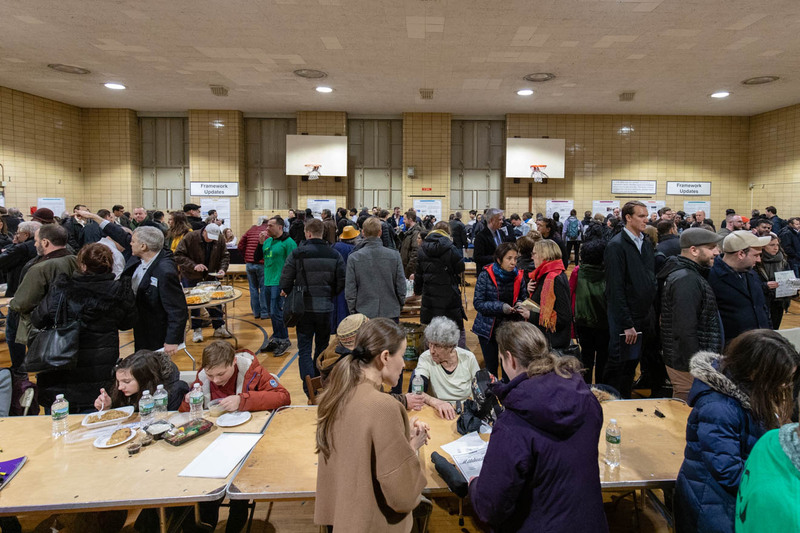 “I am pretty sure if they gave a prize for a neighborhood that did the most planning about how to think about its future, definitely in NYC or maybe in the whole world, I’m pretty sure it would be Gowanus,” he added. Council Member Stephen Levin did not attend the open house. Regarding the complaints about the open house format of Wednesday’s meeting, Keller noted that when the Framework was released last June, DCP presented it to the community board first, then held an open house a few weeks later. He said some were not happy with that process either, saying some community members didn’t feel they had enough time to “digest” the information. “There is so much here. We’ve actually responded to an enormous amount of what people want to see, and from all the feedback we’ve heard we felt just giving a presentation would be so overwhelming that we wanted to allow weeks to go by so people could really formulate their thoughts and questions and then come ready to learn more,” he said, promising a detailed PowerPoint presentation at the February 28 community board meeting.